MUNICH, GERMANY-The University of Applied Sciences at Furtwangen recently began work on a virtual reality laboratory in which Media Lab students can create real-world strategies in a three dimensional environment. Innovative for its use of current technology to create an engaging virtual reality, the laboratory offers a training and experimental environment in which all possible facets of a project may be explored before students proceed with the best solution. 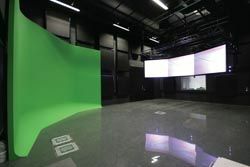 This German University's Media Lab uses high definition video projection with connectivity equipment supplied by Gefen so that students may work on projects in 3-D. Implemented by SDI in Munich, the lab uses strategically placed high definition video projection supplemented by wave field synthesis loudspeakers located around the circumference of the lab. Connectivity equipment supplied by Gefen ensures the delivery of high definition visuals with no latency period. "The technical basis for the visual distribution is the use of six projectors located in a hinged installation, each beaming high definition images on a massive rear projection screen," explained Thorsten Goecke, SDI product manager. "By polarizing the various projections, the presentation appears absolutely three-dimensional as life-size imagery flashes across the screen." To distribute the data required for high definition video, SDI relied on an assortment of Gefen HDTV extenders and splitters to deliver simultaneous imagery throughout the lab. Gefen's fiber optics cabling was installed to ensure an unadulterated distribution of all video signals.